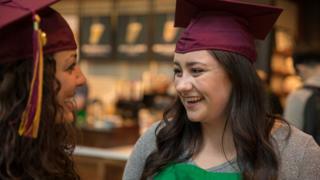 Starbucks is offering to pay tuition fees for UK staff wanting to get a degree from a US university. The coffee chain is to provide the cost of university as an employee incentive in the UK, for courses taught online by Arizona State University. A similar scheme in the US has enrolled 18,000 staff - and the UK will begin with an initial 100 places, with the promise to expand if there is demand. A spokeswoman said staff were asked about "what matters most to them". "And many expressed how difficult the financial strains can be to obtain a university degree," she added. It will also be seen as a way of attracting and retaining staff, following warnings that coffee outlets could face recruitment problems after Brexit. The Pret A Manger coffee and sandwich chain has said that only one in 50 applicants for its jobs is British, raising concerns about staffing if there are fewer workers available from the EU. Starbucks is offering to pay tuition fees for staff while they carry on working for the firm. The incentive is available for employees at all grades, as long they have worked for the firm for three months and do not already have an undergraduate degree. They would study part-time, outside of working hours, from October 2019 and have a choice of about 40 degree subjects, including economics, information technology, political science and accounting. The US version of the scheme was launched in 2014, with more than 2,400 staff now having graduated. Martin Brok, Starbucks' European president, said the firm would "pick up the bill" for staff who have missed out on going to university or who "had to put their studies on hold". Starbucks has attracted criticism over its tax affairs - but a spokeswoman said the firm paid its taxes in full and when all its companies were included, it paid corporation tax in the UK at an effective rate of 25.3%. Michael Crow, president of the Arizona State University, said the arrangement teaching staff from the coffee chain was a step towards providing "an education to all who desire to learn". A review of tuition fees is currently considering whether they are too high for universities in England, with suggestions they could be reduced from the current £9,250 per year.